It doesn't help that my new job is teaching 1st grade... which is amazing, but "weekend craft" heavy. Let's just say I cut out a lot out of laminated letters. And crazy shapes. And sea animals. Not as many dress patterns. So let's REWIND to September 2011 and look at a plaid variation of Sorbetto that I made, but never photographed, way back then. Trim: Something lacy I picked up in NYC - August 2011. Cost: No idea, but I'll guess $7. I love how the Macaroon sleeve looks in the crisp shirting. A very comfortable shirt. I used the trim to finish the sleeves and neck line by stitching the trim on right-sides-together, turning the seam under, and top-stitching it down. This method caused the trim to stand straight up - as you can see below - which is a little odd, but I kind of like it. 3-D Baby. 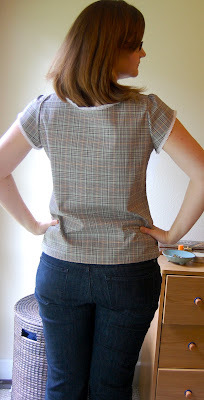 Perfect to wear around the house while I start my next sewing project! Cute! I like the sleeves a lot, and the plaid looks great!